The Suit of Pentacles (also known as Coins or Disks) is representative of the element of Earth. The Suit of Pentacles cover material aspects of life including work, business, trade, property, money and other material possessions. The positive aspects of the Suit of Pentacles include manifestation, realization, proof and prosperity. 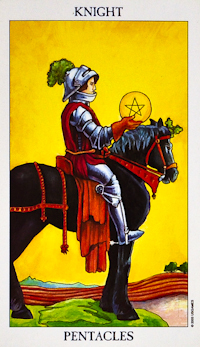 The Knight of Pentacles, like the Knights of the other suits, represents work, effort, and the responsibility that follows upon the dreams of the Page. The Knight of Pentacles sits upon a heavy plough horse in the midst of a field. In his hands he carries a single gold coin. His eyes reflect careful thought and consideration. The Knight is engaged in the often toilsome, routine efforts required to realize the dreams of his heart. He is building the foundations to support his dreams and his goals. The Knight of Pentacles works in a very methodical and rigorous manner. Though his visions may not be earth-shattering, and his methods are certainly not original, the Knight of Pentacles sees that everything he undertakes will meet with nothing but success. He has the patience to accomplish all his tasks and he is incredibly reliable due to his sense of responsibility and commitment. As a court card, the Knight of Pentacles may represent a part of yourself, someone in your life or an event. As a part of yourself, the Knight of Pentacles suggests that you need to be trustworthy, reliable and a good provider. You need to follow a routine to ensure that an important task or job is completed from start to finish at the standard expected. You are in ‘implementation mode’ and are committed to getting the job done, even if it requires hard work along the way. You are also fiercely loyal and prepared to do whatever it takes to ensure the job gets done. There is a certain element of perfectionism associated with the Knight of Pentacles. You are meticulous in your approach and you make sure that everything is planned and executed down to the finest detail to create overall success. You will never leave a job half done. It is essential to you that you complete all assigned tasks and projects to a certain standard and that you follow through on your promises. If you are dependent on the efforts of someone else to help you accomplish a goal in life, they will prove trustworthy and reliable. They are as committed to your goal as you are and they are very conscientious and committed in their work. For example, you may have employed the help of a house cleaner who consistently does a great job, or a virtual assistant who is dedicated to assisting you with every task you throw their way. This is someone who wants to do a great job and is not afraid of hard work in order to meet your expectations. As an event, the Knight of Pentacles often shows a time when you will have to assume responsibility and take charge of a situation. You may be assigned a project or given a task to do, and you will have to commit your time to see that project through to the end successfully. With the Knight of Pentacles, you will be required to accept responsibility without any complaints or grudges. Sometimes, the Knight of Pentacles points to the more mundane elements of life. It represents routine, day-to-day activities, and general hard work that can sometimes be a ‘slog’. It indicates a conservative approach that is risk averse and very ‘safe’. This card also asks you to continue doing what you are doing, plodding along and making gradual progress. There is also no need to change your approach, just ‘more of the same’. Go with the flow, stick with your usual routines, and over time, you will reach your goals. Similarly, the Knight of Pentacles suggests that you are taking a very moderated and conservative approach to life right now, and while you may be feeling that change is imminent, you are sticking to your tried and tested ways of doing things. You have established that you need routine and careful planning if you are to achieve your goals. It may not necessarily be a very interesting or exciting period but at least you know you are on the right path to achieving your goals. Even if you are growing weary and tempted to quit, this Knight beckons you to keep at it, keep grinding away at it and you will eventually see success. Keep your promises and stay true to your commitments. Conversely, if a situation has been stagnant for some time, you might see this Knight as a suggestion that you are being a bit stubborn and could do with a compromise. At times, this Knight can become too narrow-minded when he is fixated on his own ‘stuff’ and is hard-headed, obstinate and resistant to change. The Knight of Pentacles indicates that you are working very hard on an assigned project or piece of work. You are in planning and execution mode, ensuring that you complete the task within the set timeframe and at least at the performance level expected. You are prepared to do what you are tasked to do and follow the protocols and organizational processes to ensure that it is done ‘right’. Now is not the time to suggest doing things differently! You must work within existing systems and accomplish what people expect you to accomplish. If you are looking for work, then the Knight of Pentacles suggests that you need to be very methodical in your approach. For example, you may want to maintain a spreadsheet of organizations or jobs that you have applied for, to keep track of your applications. In your interviews, you need to present yourself as a ‘worker bee,’ someone who is willing to go the extra mile to do a great job, and who is willing to do what is requested. The Knight of Pentacles is associated with careers in accounting, process or data management, operations, or administration. In finance the Knight of Pentacles suggests that you need to maintain a conservative and low-risk strategy for how you invest and spend your money. It is with hard work and dedication that you will slowly grow your financial reserves. The Knight of Pentacles personality type is loyal, patient, committed, dedicated, methodical, and meticulous. His approach may be boring, conservative and very ‘routine’, however you can rely on him to get the job done at the standard you expect. He is very much about fulfilling obligations and keeping his promises. He is a dedicated worker and a loyal servant; when he says something will get done, it will. His persistence is virtually inexhaustible and he will stick at a task until it is complete. The Knight of Pentacles likes doing things the traditional way, particularly when he knows that it is tried and tested, however this can get in the way of creativity and imagination. Physically, the Knight of Pentacles represents a dark-haired young person with dark eyes. If you are looking for love, the Knight of Pentacles is all about routine and sticking to the program in order to find your perfect partner. Thus, this card encourages you to keep plodding along and do what you are already doing. You are already on the right path, and with some patience and careful planning, you will soon find new love. The Knight of Pentacles may also indicate that this personality type is about to enter your life. He or she will be very conservative but conscientious, practical and dedicated to growing the relationship. They may not be as spontaneous as the other Knights out there but at least you know that this Knight will commit to the relationship and will see it through. In an established relationship, the Knight of Pentacles can indicate that your relationship is just plodding along at the moment. There are no major issues or problems, you are just following your usual routine and keeping things consistent. There can be a risk of boredom, particularly if you prefer your relationships to be a bit more dynamic, in which case you may benefit by breaking your routine together and doing something different. The Knight of Pentacles can also indicate that both of you are very committed to your careers and working lives and may be struggling to focus on the romance of the relationship. If this is the case, then make time not only for work but also for each other. Spiritually, the Knight of Pentacles suggests that you are inclined to continue with your usual rituals and routines when it comes to spirituality and religion. You may be going to church every Sunday, or waking up early for yoga every morning. This is a good time to stick with your routine and to stay focused on your spiritual task at hand. In Health, the Knight of Pentacles suggests that you need to continue to follow a routine (be it an exercise, diet or health treatment routine), even if you are finding that it is becoming monotonous and mundane. In order to achieve your optimal health, you will need to persist and stay focused on your health program.